It's rather intimidating to see them all together forming a literary tower, isn't it? I don't quite know what came over me a week or so ago, but I suddenly decided I must work my way through all of Harry Potter's magical adventures. I had read the first two books ages ago when they first came out, and then I somehow lost my magic groove. I remember liking them but not loving them, so Harry and I parted ways. This time, in the spirit of a complete effort (or addiction, you decide), I re-read the first two with fresh eyes. I liked them more this time. Now I am in the early stages of Harry number three (Harry Potter and the Prisoner of Azkaban) and am completely hooked. I feel like I know the characters better and am loving JK Rowling's wicked sense of humor. The word on the street (even though I'm quite late to the Potter Party) is that each book is better than the one before it. Since the next books are quite hefty and require a substantial investment of time and energy to read each one's bazillion pages, I hope it's worth it. I haven't read Harry but my husband liked them a lot. And I remember the sight of some of our students with their nose buried in those books on summer vacation. That was amazing to me, really. I resisted the HP craze for a long time. 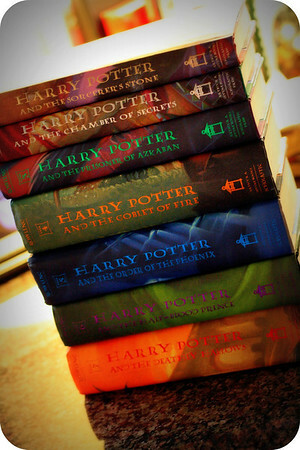 But then my mom got the first six books, so I borrowed them from her and read them before the seventh book came out. And then I read them all again about two months later. The sixth book is my favorite one. I think it presents the most challenging decisions for the characters and the reader to accept. The movies are entertaining. I didn't enjoy the first few too much, but that was mainly because the actors were kids and acted like kids, which is to be expected. I was very disappointed in the most recent movie though (the sixth book). The books are fun to read. No one is going to mistake them for great works of literature, but I enjoyed them and have slowly been collecting them from paperbackswap.com so that my kids can read them with me when they are a little older. I just finished reading number two tot he girls. Now, Jane is going off on her own. She is starting 3 as well and totally addicted. I haven't read any of them, but think I will this summer.